The AC Milan shirt sponsor from 2001 to 2002 was Opel. 2001-02 was the only time this 3rd shirt was worn. The white was the away from 2000-02 but this 3rd shirt was special. It is Sheva's number 7. 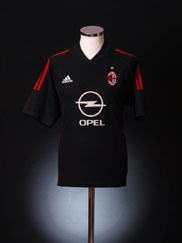 2005-06 AC Milan Silver GK Shirt Adidas Original Vintage shirt from Classic Football Shirts Ltd.